With this Naomi Home Beveled Mirror you will be able to enjoy its modular design and display the mirror in variety positions and locations, don't be committed to one location in the house...with this floor mirror you have the luxury to move it around your house to the place needed most. Add this full length mirror to your bedroom as you are trying on the perfect outfit to start your day...or brighten up your living area, with its elegant and stylish modern look this beveled mirror will surely be the talk of the party. 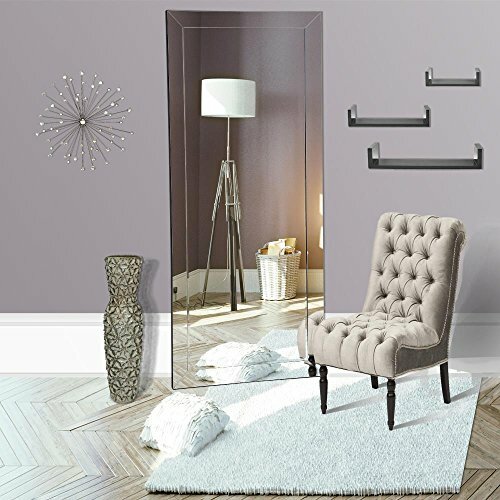 Use this modern mirror to accent any room in the house and this versatile designed mirror may be used as a leaning mirror, mounted vertical or mounted horizontal...and complete your home with style, Naomi Home Mirror. View More In Floor & Full Length Mirrors. If you have any questions about this product by Naomi Home, contact us by completing and submitting the form below. If you are looking for a specif part number, please include it with your message.